The Button Project exhibition is still available to check out at Macclesfield Heritage Centre. With around 300 buttons each hand made by a range of artists, designers and crafts people it is a showcase for personal skill and the joy of creating an object which is beautiful as well as functional. The museum curator, Annabel Wills, says "The great thing about The Button Project is the way that it brings together the historical collections with contemporary artists. The town has its beginnings in the button trade, and Macclesfield silk buttons were all handmade. Today's makers help to keep that heritage very much alive." Decorative and functional fibulae brooches were used to fasten clothing before buttons. 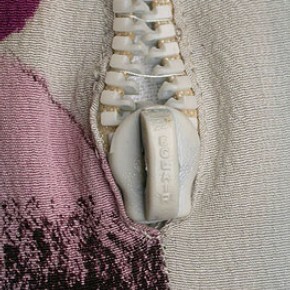 Selection of zips used in garments by Elsa Schiaparelli, a pioneer in this new garment fastening technology. Many of these pieces didn't survive or were in a fragile condition due to the unstable nature of the early synthetic materials. Images courtesy of V&A curating dept. I made this necklace to show the harder edge of buttons. Cast from a selection of old pressed metal buttons, they would fasten functional clothing for working in. Made to be used and last, they showed their quality by having the companies name written on the button, like a designer label or branding motif today. Cast as a one off in resin combined with metal powder, the rest is made from leather and secured with a small steel hook at the back. Wood and metal printing block in Macclesfield's museum, it is full of beautiful objects like these used in their textiles production, often displayed "in situ". Here's my button which you can see at the exhibition at Macclesfield's Heritage Centre until 8th Aug.
Macclesfield's SIlk Museum has plenty of ephemera from the old silk production on show. These original tags were a sign of quality for their products-made in the style of sealing wax-just like my resin and silver trompe l'oeil button! The Button Project has been the work of glass artist Victoria Scholes. I'm so glad she had the idea and passion to create this exhibition, bringing together so many people who love making things.